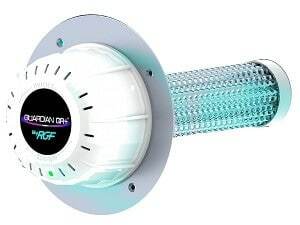 The Guardian Air QR+ is an in-duct air purifier that eliminates bacteria, viruses, mold and VOCs. The Guardian Air QR+ also reduces unwanted odors from cooking, cleaning chemicals, pet areas, smoke and musty air. Once installed, the QR+ works to transform your indoor air into fresh, clean, pure air throughout your entire home. The Guardian Air QR+ not only reduces bacteria, mold, viruses and odors, it’s PHI technology can reduce sneeze germs by 99% by the time the sneeze has reached three feet. The Guardian QR+ provides whole home purification not just single room or partial coverage. The Guardian Air QR+ is affordable and effective, so breathe easy and call now to bring all the benefits of cleaner, less polluted indoor air to your home and family. 813-909-0809. You may want to check out the REME HALO® which can also remove particulates.